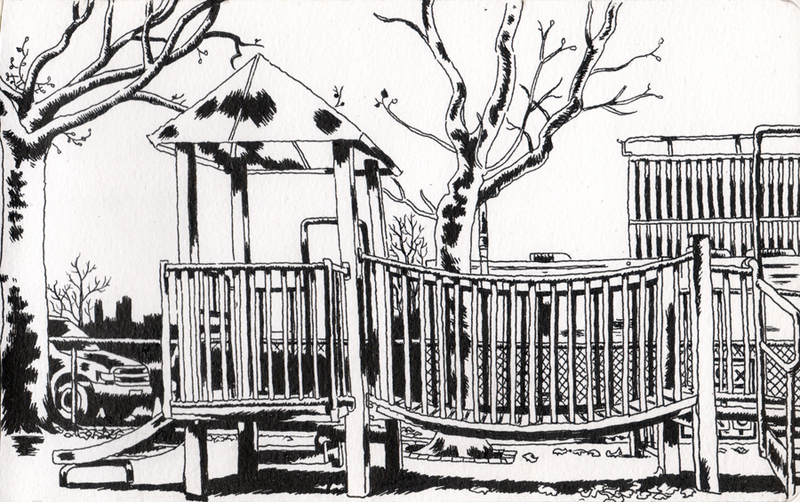 Last Fall I had the idea to do a “drawing of the week” to post on this blog, and started a drawing of a playground near my apartment. I only finished it yesterday. I had a similar idea about a year ago, and I also finished that one months later. Despite my slow progress I’d like to try to get on the horse again and at least occasionally post some drawings. These drawings are on sale for $200.oo each, including postage. They’re both 5 X 8 inches on heavy cold pressed watercolor paper and drawn with permanent black sailor ink. You can click on them to see them bigger. 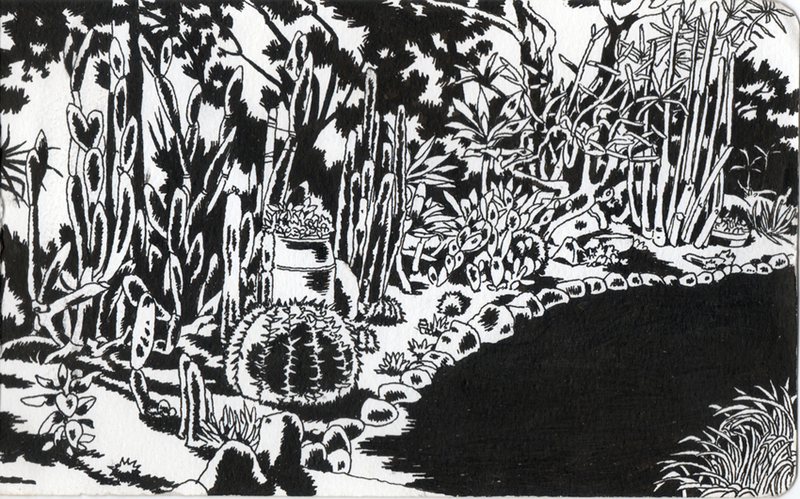 This one was drawn at the Self Realization Fellowship in Los Angeles, and has some extra bonus drawings on the other side. You can buy this one here. …what’s that? Oh, my promised bi-weekly comic? I’ve been working for the last week on a comic about confidence, but temporarily lost the confidence to finish it. Hopefully I will have regained it within the next few days and will post it. Please check back in soon! One question – what’s sailor ink? Sailor ink is fountain pen ink. It’s permanent and doesn’t get all smudgy. It is made from the blood and bones of actual sailors. You can order it online. What a great Idea. Looking good Lady.